This set of Food Engineering Questions & Answers for experienced focuses on “Fluid Mechanics-2”. 1. Statement 1: For rough control of flow _____ are used. Statement 2: For fine control of flow _____ are used. Explanation: Both gate and globe valves are used for rough flow. For fine control of flow, needle valves are used. 2. Which of the following is untrue about non-return valves? Explanation: Both the statements are true. 3. Statement 1: Generally needle valves are not used for liquids. Statement 2: For a unidirectional flow, non return valves are used. 4. Which of the following is true about Centrifugal pumps? Explanation: Centrifugal pumps are not suitable for corrosive and toxic fluids. It does not have a high pressure head. Priming is needed. 5. Which of the following is true about Rotary pumps? Explanation: All the given statements are true. 6. Statement 1: Diaphragm pumps can handle corrosive material and do not have leakage problems, but, they only vibrate hence the output is low. Explanation: Statement 1 is true. Diaphragm pump is an example of a positive displacement pump. 7. Statement 1: Fans and blowers create pressure energy whereas compressors don’t. Explanation: Compressors create pressure energy whereas Fans and blowers don’t. Explanation: Drain pipes are present to remove Condensate. Explanation: In food industry, chlorine line is painted Yellow and hydrogen line is painted Red. 10. _____ is a mechanical gadget used to prevent leaks. Explanation: Stuffing Box is a mechanical gadget used to prevent leaks. 11. In a rota meter _________ force is directly proportional to _____ of the fluid. Explanation: In a rota meter, Buoyancy force is directly proportional to Linear Velocity of the fluid. 12. Which correction of the orifice meter is corrected in the venturimeter? Explanation: In venturimeter, the eddies are not formed at the entrance to the downstream is not very big as compared to the vena contracta. The throat diameter cannot be changed. 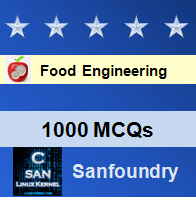 To practice all areas of Food Engineering for experienced, here is complete set of 1000+ Multiple Choice Questions and Answers.